1. Preheat oven to 375 F. Melt butter or margarine in an 8 x 8-inch baking dish. 2. Stir in salt, oregano, basil and garlic. 3. Add almonds, stirring until coated. 4. 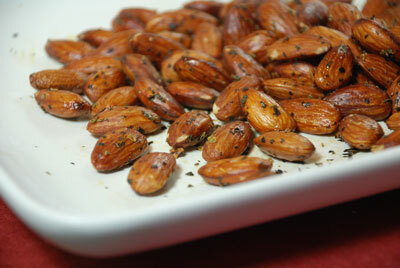 Bake for 15 to 20 minutes, stirring occasionally until almonds are crisp. For best flavor serve within a few hours or store in the freezer.